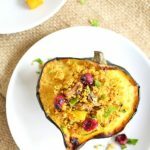 Ahh the simplicity of stuffed acorn squash with lots of fall flavors is just about more than I can handle! This incredibly delicious dish takes me back to being a child. Growing up, there was a big maple tree in our backyard. Of course every fall it’s leaves would change and drop, and you know what that means! Time to rake them up into a big pile and jump in them! Oh yes, this was a yearly occurrence. For some reason, this dish reminds of those days. The crisp air and smell of the leaves. One of my favorite fall memories! It’s this hearty and nourishing dish with lots of fall flavors that makes me want to go back to those days…. If you can’t tell by now, I am in love with winter squash! Butternut, acorn, pumpkin, honeynut, kobocha… you name it! 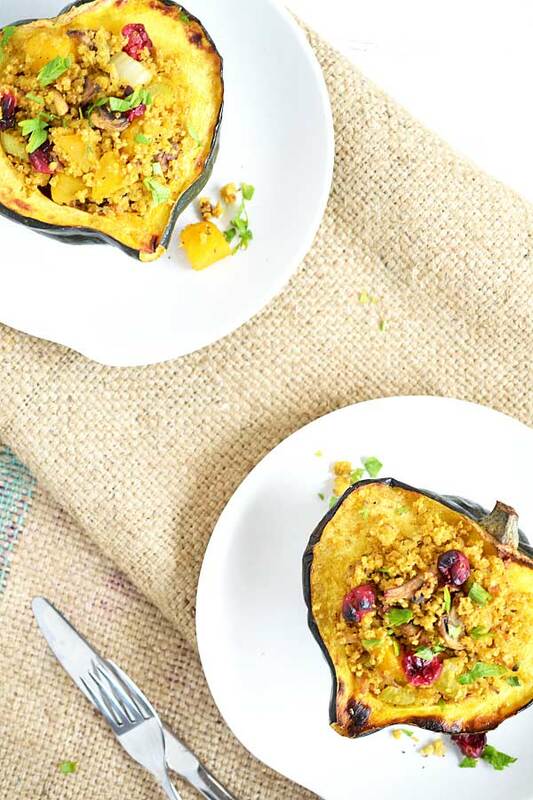 They’re so easy to use, versatile in what you can make, from my Dairy-Free Acorn Squash Soup to No-Bake Vegan & Paleo Pumpkin Cheesecake, you can do pretty much anything with it. Or straight-up roast it and eat with some avocado and my Date-Sweetened Ketchup. But this post isn’t about all the different ways you can prepare it. 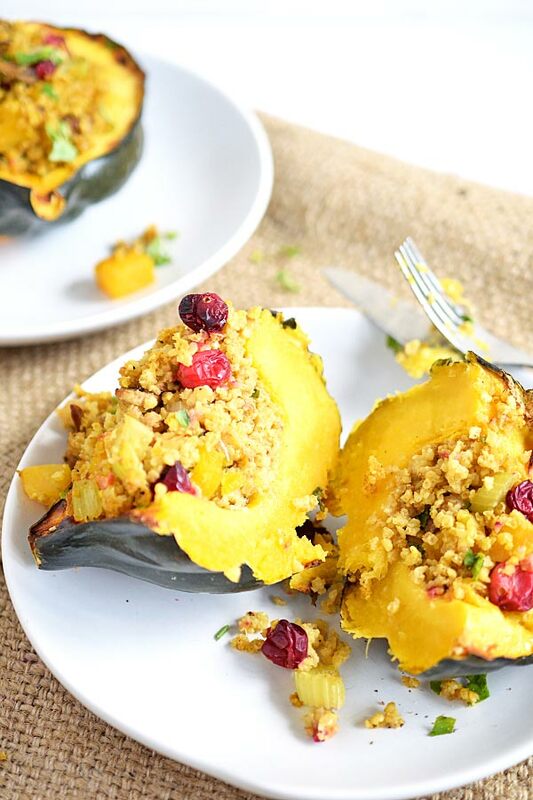 It’s about this stuffed acorn squash recipe. My brother was the one that suggested I create a stuffed squash recipe, and this is what came about. It’s gluten-free, dairy-free, and SO easy! The filling is very simple. It’s got millet (which I absolutely love and the texture works so great in this! ), roasted golden beets and garlic, celery, mushrooms, cranberries, and parsley. Seasoned with a little dijon mustard, cumin, lemon, salt and pepper. It’s got a bit of a Thanksgiving stuffing vibe going on, but with those cranberries?! So much better! Preheat your oven to about 375°F. Cut your squash lengthwise and scoop out the seeds. Rub the cut side with a little coconut oil and sprinkle of salt and place on a baking sheet cut side up. Wrap the diced golden beet with a few cloves of garlic (I used 1 medium-size beet and 3-4 cloves, but use as much as you'd like) in parchment paper. Bake this and the squashuntil fork tender and golden brown, about 20-30 minutes. While these are roasting, saute your onions, mushrooms, and celery with a little coconut oil, ground cumin, and salt until fragrant and slightly caramelized. A great starting point is 1/2 an onion, a handful of mushrooms, and 1-2 stalks of celery, but adjust to what you like. Add your cooked millet. 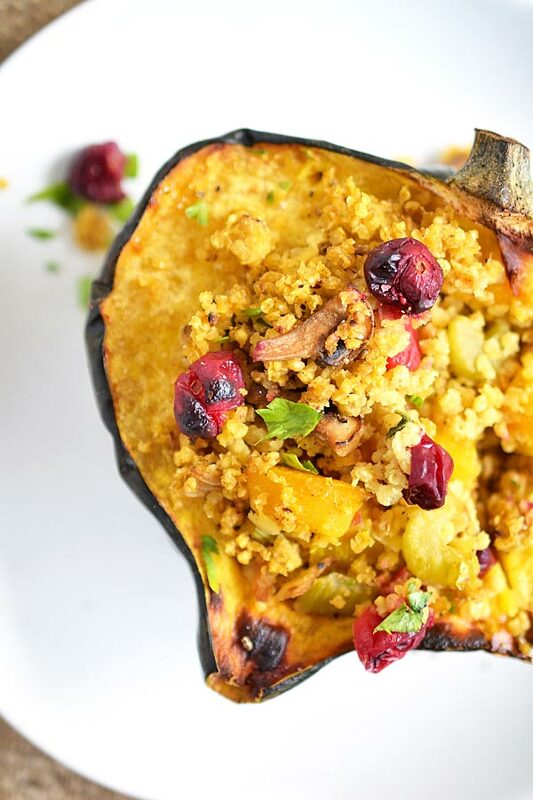 As far as amount, anywhere from 1/2 - 3/4 cup of cooked millet to stuff each squash half is perfect, so for the 2 halves you'd need about 1 - 1 1/2 cups worth. At this time, your squash should almost be done. Add a handful or 2 of cranberries on your baking sheet and bake for a few minutes until they pop. Time to flavor the millet up. Mix in the juice of 1/4 of a lemon, a squirt of dijon mustard, and nutritional yeast and black pepper if desired. Grab a handful of fresh parsley, chop, and mix in. Remove the vegetables from the oven. Chop the roasted garlic and add to your millet along with the beets and cranberries. Mix together and taste. Add any extra seasonings, additional dijon, lemon, salt, etc. until it is to your liking. On the same baking sheet, stuff as much filling as you'd like into the squash. Broil for a few minutes to crisp up and brown the filling. Serve and enjoy! This can easily be made into many servings, just increase the filling!